With so much to do, some days really are a blur. I know I was there, I’m still here, so something happened…details? I haven’t got any for you! 😉 Just kidding of course! Thursday was one of those day, but I have a few details to share. I had an appointment for a hair cut at 12:30p but before that I walked down to see Alice. She had a discount card that I needed to borrow. 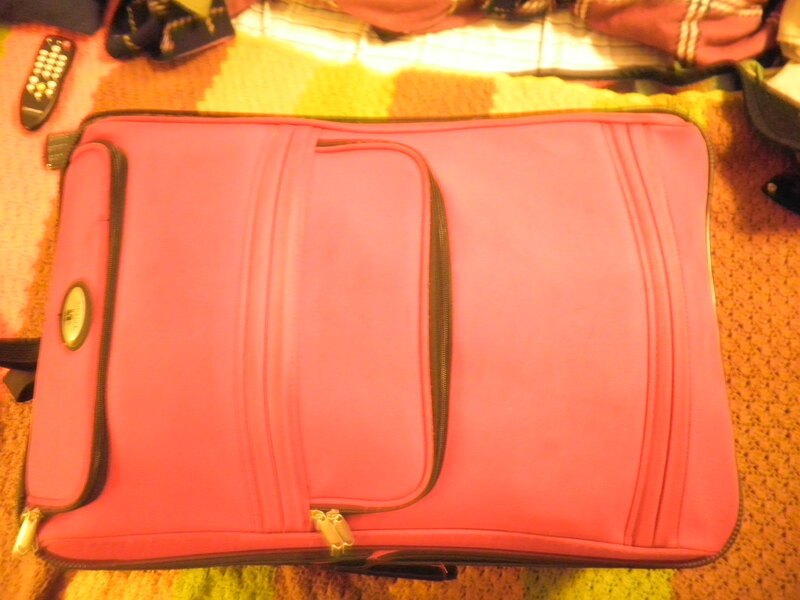 While talking I mentioned my dilemma from yesterday…4 bags and counting for this trip and my frustration with it. She had a marvelous solution. During the time Alice and Gail spent in Florida this summer, Alice’s 12-year-old niece came to visit. During her visit, Alice introduced her to the joys of the Great Thrift Store Tour! She fell in love and with $29.00 bought her entire school wardrobe! She’s hooked now. So anyway, Alice continued to shop for her while still in Florida. So much so that she needed an extra suitcase to bring home all of her treasures. 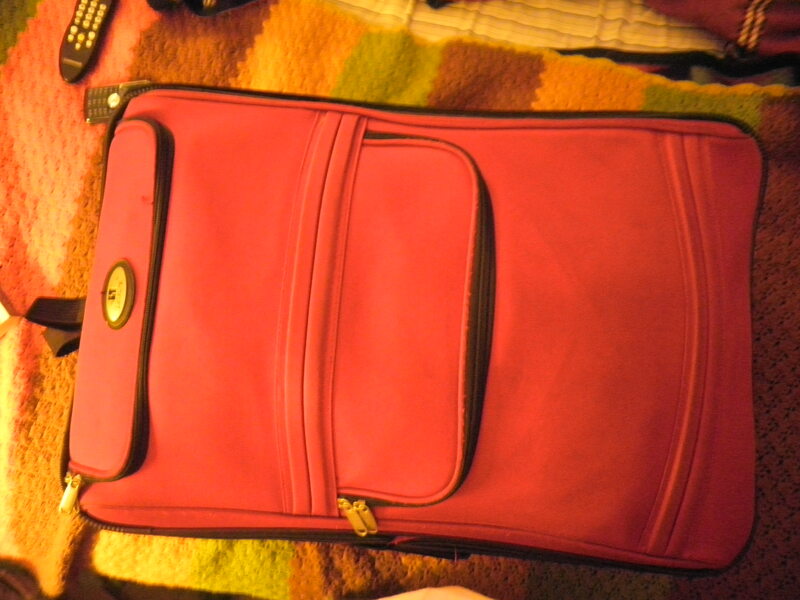 While I was there, we went to Last Chance and Alice got a huge rolling suitcase for only $5.00. Alice didn’t need it other than for that purpose…so she gave it to me!! She’s big and red and she now holds ALL of what had been in those 4 bags except for some books which are now in a tiny tote bag!! I was SO excited! Alice doesn’t want her back so I think I’ll call her Big Red! She’s mine now. Gotta love a thrift store! I did get my hair cut. It looks good, but I didn’t bother to photograph it. You’ll see it soon enough! 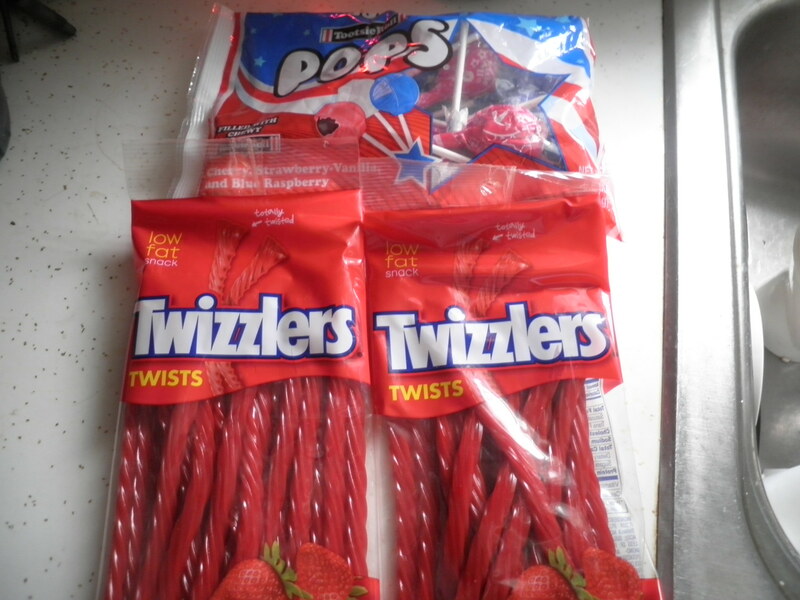 Twizzlers are our Favorite road trip snack…and I don’t think I even have to tell you how I feel about Tootsie Pops!! I realized late in the day that I really hadn’t eaten anything. I quickly put together a salad that looks suspiciously like all of the other salads I’ve had this week so…visualize, Kids!! We pick up our rental car today and I get to find out if Big Red will actually fit in the trunk! I have faith in her. Lots more errands to run also and probably 20 other things I can’t think of at the moment. I’m getting excited, but I’m trying to not forget anything. Friday may turn into another Blursday! Help Me, Big Red!! 1 Day to Go…Yikes!! I have Weight Watchers tomorrow morning…No Clue how that will go!! This entry was posted in Uncategorized and tagged Great Thrift Store Tour, Great Tootsie Love, road trips. Bookmark the permalink. The only thing better than a thrifted bag is a free bag that someone else thrifted! I love her name. Thanks, Stephanie! Glad you like her name, I thought it was appropriate! My luggage is leopard print so I can spot it a mile away on the airport merry go round. Love that your friend got it so cheap and then gave it to you. When I was a kid and got something new I was so careful and didn’t want to use it/wear it a lot because I didn’t want to ruin it. Now I am the complete opposite & love to run things into the ground. That’s how I know I got my money’s worth. I give out tootsie pops every Halloween. They are my kids favorite. I don’t see why we should buy things if we’re not going to use them. Oooo…you just gave me a good idea for a post! Thanks,Marie! So glad you little ones are Tootsie Poppers just like me!